The archaic energy of an 11-piece marching band meets the hypnotic power of techno. The impetuous passion of a freaked out marching band finds its new order in the intricacy of electronic music production. Two years after their inception on Hamburg’s Schulterblatt street the self-styled techno marching band MEUTE is releasing its long-awaited debut album TUMULT. 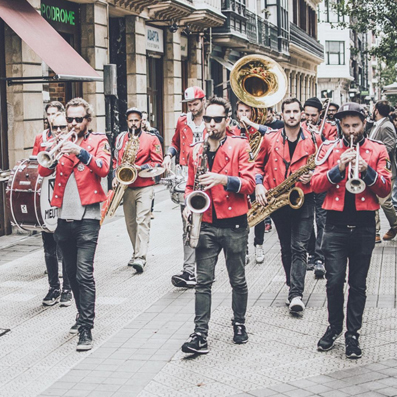 A video of their first guerilla gig has won the band more than 60,000 Facebook fans up to now and catapulted them to the top of the list of the most booked festival bands in Europe. Between what now amount to 150 gigs (Lollapalooza, MS Dockville, Trans Musicales, Dour, Ozora, Paléo, YEAH!, Fusion etc.) the musicians have still found time to go into the studio and record their combination of hypnotically rhythmic techno and expressive brass music. The 2016 tracks already released provide a taster of the style of the album.